White Roof Coatings Protect Your Roof from the Sun's Damaging UV Rays! While there are several reasons why a roof can start leaking, many people do not realize that the UV rays from the sun are the most damaging to your roofs surface. Dark roofs absorb a great amount of the sun’s heat, aka UV rays, causing the roof to become a brittle, less elastic substrate. When your roof becomes brittle, the membrane may lose thickness and become less defensive against leaks. A similar situation occurs when the roof loses the capability to expand and contract with fluctuating temperatures - cracks occur and seams split, leading to roof failure and more leaks. It is important to use one of the AcryShield white roof coatings to protect your roof against these common side effects from the sun. AcryShield coatings are packed with high performance UV blocking pigments prohibiting the sun’s heat to be absorbed by the roofs surface. This keeps the surface temperature of the original roof cooler, allowing no further damage or premature roof failure to occur. The roof remains flexible and strong; protecting the assets inside the building from water damage caused by leaks. The minimal heat absorption also allows the interior of the building to remain cooler, cutting energy consumption costs and usage to cool the building. White roof coatings not only protect your roof from failures and leaks caused by the sun, they also can extend the life span of the roof indefinitely. Using one of National Coatings AcryShield Roof Maintenance Systems, you can recoat your existing roof every ten or so years, adding additional layers of protection and waterproofing, while eliminating the need for a costly roof tear-off. Building codes typically prohibit you from adding more than two roofs to your building without tearing the roof off and starting new. 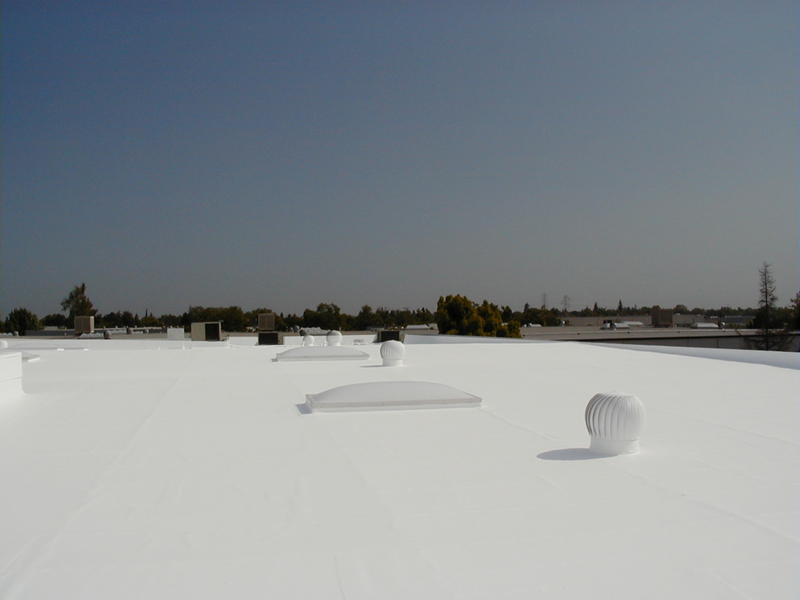 White roof coatings are usually not considered an additional roof; therefore, eliminating a roof tear-off. For more information on National Coatings roofing systems and white roof coatings, download our Full Line Brochure.